It’s been over 100 years since Russian playwright Anton Chekhov’s death. We’re still struggling against a traditional view of how to perform, and indeed experience, a genius that straddled two very different centuries. 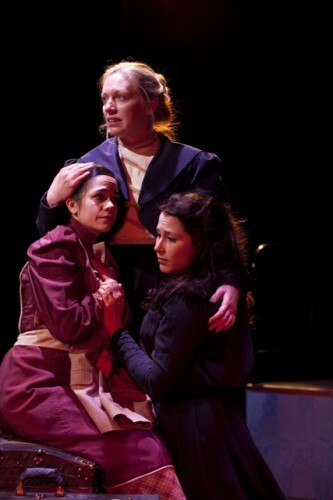 Last year, Theater J attacked some sacred cows with a lively production of The Seagull. I expected a young company like Constellation Theatre to be able to blow away some of the same cobwebs with their take on Three Sisters. I certainly loved the gusto with which they attacked Feydeau’s A Flea in Her Ear. However, this is a very respectful production, full of talented actors making safe choices. The love of the play is evident, but with a few notable exceptions, no one seems willing to break their established view of how Chekhov should be done. If you’re new to Chekhov’s work, then this is a fine place to start. But if you’re looking for any risk-taking, you won’t really find it here. There’s just too much reverence for that. Director Allison Arkell Stockman makes two great choices from the start. She uses the Lanford Wilson translation, nicely accessible while retaining some lovely poetic phrases. She also has the play performed in the round, which gives the illusion of our eavesdropping on the lives of the Prozorov family – three sisters Olga, Masha and Irina and their brother Andrei. Her direction highlights the trap closing around the family as one by one their dreams of a meaningful, rewarding life are trampled on. Pretty depressing stuff, thankfully lightened by humor (Chekhov billed it as a comedy, after all). The plot is a journey through several years with the Prozorov family, who live in a provincial garrison town with their daily routines enlivened by the soldiers. All they have is a dream of moving to Moscow and finding meaningful work (both metaphors would be humorous to an audience at the time, now they are symbols for any childhood dream held dear). Little by little, they lose their illusions, and become adults in a drab world. The actors, as talented a group as they are, are mostly staying safe, with a lot of playing to emotion and not action. Taken up one more ironic notch, it would be funny – these well-off folks’ constant protestations that work is the answer is after all meant to be a hard slap, highlighting their class’s inability to see their world crumbling about them. But here it can come across as tiresome – sadly, I found myself unable to empathize with the three sisters themselves until the second half, when all three actors come alive as they face reality and disillusionment. But until that point, I was more drawn to others. There are some risk-takers who raise the temperature on every entrance. Mark Krawczyk’s Solyony has a rising psychosis that provides a badly-needed element of danger. “If that child were mine I’d fry it in a skillet and eat it,” he says in easily the funniest, scariest moment of the production. Michael John Casey bears both a striking resemblance to Tsar Nicholas II and the weight of self-deprecation as the lovesick yet practical Vershinin, As the rapacious social climber Natasha, Katy Carkuff practically stifles the air of her rivals. And Joe Brack’s Andrei nails the sad heart of the play, his wild Pushkin hair slowly being slicked down, the very breath being sucked out of him as he watches his dreams shrivel. Again, this is a fine production with clarity and focus to the text and its metaphors. I just found myself, like the characters, longing for more daring.